You get what you want when you least expect it. 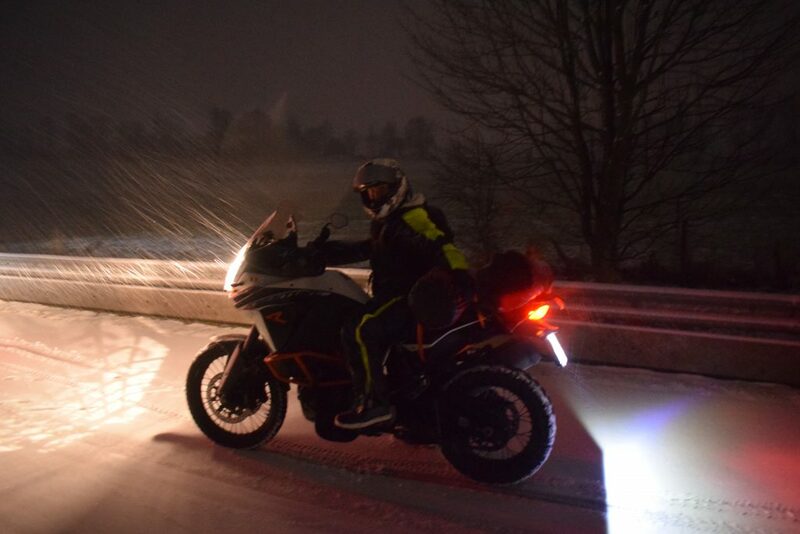 When our group set out for the Altes Elefanten winter rally at the Nurburgring in Germany, we didn’t expect extreme riding conditions. This rally is a moderate snow rally based at the campsite of the legendary racetrack, so there are hot showers (not that anyone uses them…), electricity plugs and even a restaurant when you can’t handle the cold anymore and need some boiling hot beverages to get out of your hypothermia. Despites it not having the same ‘touch’ as the Elefanten we still wanted to go, meet up with old and make new friends, just having fun, make a fire and enjoy the company of other bikes, snow or no snow to be found. 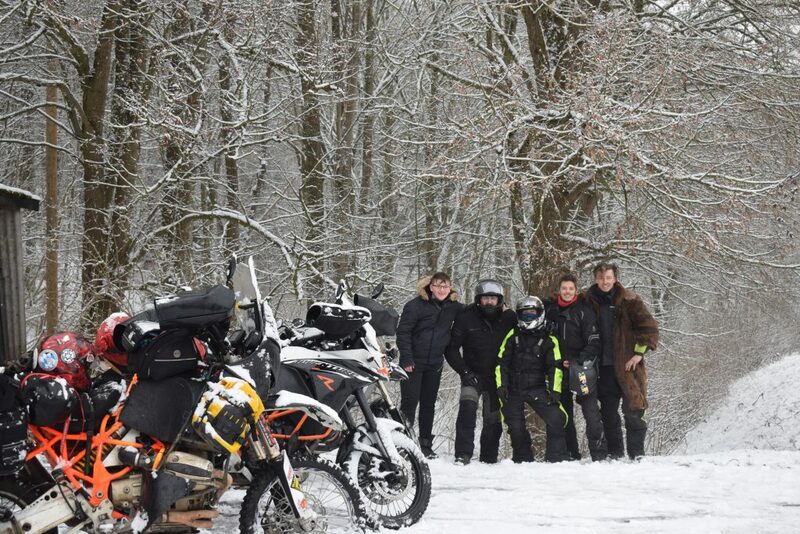 A week before departure Ewan asked me if it was ok to join with a pillion and road tires and I was like “Hell yeah, roads are open up to the entrance of the campsite, it’s Germany not Belgium, they know how to handle a little snow.” So Ewan, Jolan and Kenzy decided to join in on the fun and the ride. Friday evening after work the group gets together in Oostkamp around 21.30 after work to crunch a 400 km ride to the Nurburgring. It’s going to be well after dark when we’ll arrive and then we’ll still have to make our hideout, because like at Elefanten, we did not pack a tent. The first 300 km are done pretty fast, the group has a good pace and the dark doesn’t slow us down. Instead the highways are empty and luring us to go faster. The fun part begins when we cross the border with Germany around 1h30 in the night. Small flecks of snow start coming down and I can barely hold in my childish excitement. Fresh snow! As time goes by the white blanket thickens and makes the tarmac very slippery, our steady pace drops to snaillike movements and when the snow covers the two way lane streets completely, it becomes a struggle to get forward. 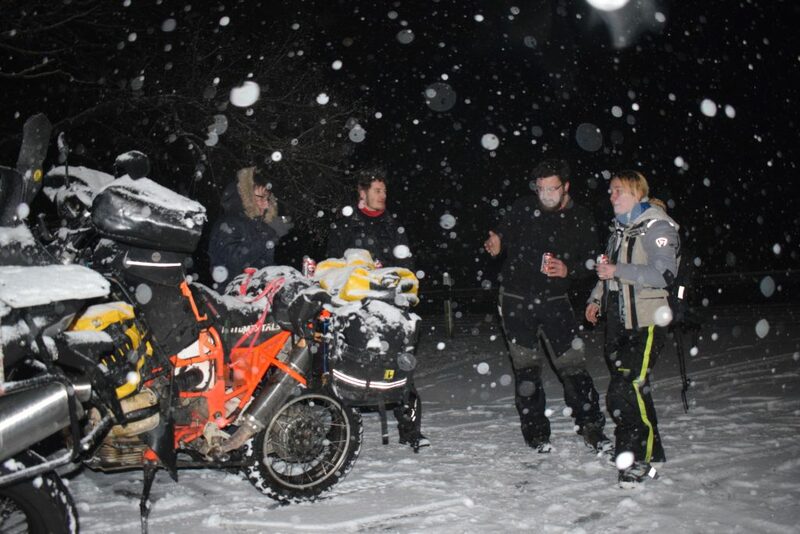 Ewan slips, losing Jolan, his pillion, and a suitcase along the way. Both are fine and so is the luggage but I’m feeling so guilty telling Ewan the streets are clear but he doesn’t seem to mind and has a great adrenaline kick out of the experience. For an hour we continue being stubborn and just ride on. Despites our best efforts we’re not moving on the map anymore and some crashes from all of us later we decide that the first place where we find a hideout, we’re going to stop and rest. It’s only 50km to the rally anymore, but at this pace we’re going to need hours to get there. 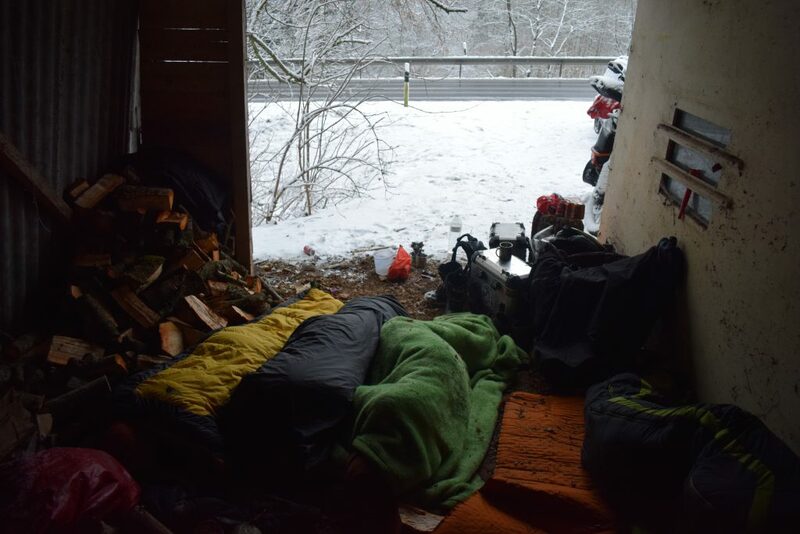 After a while I hear Bart shouting in the Scala that he found a woodshed near a house where we can spend the night. Slipping and sliding we get the bikes onto the driveway and our helmets can’t get off fast enough to pop open the first beers. Although we’re tired, we just can’t stop making fun and savor every second of this unusual ending of the evening. It takes some liters of beer, a bottle of whiskey and many laughs to get the first of us five into the sack and when we finally see the snowplows arriving and clearing the road around 5h30 we hurry into our sleeping bags to get at least three hours of naptime before hitting the road to the rally again.